If you’re looking for first class voice lessons and vocal coaching, look no further. Our voice instructors will work with you one-on-one and help you hone your singing skills and unleash your singing potential through private voice lessons. 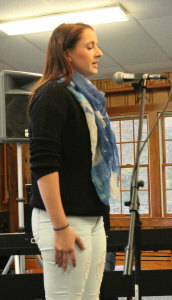 Our students come to us for vocal coaching for a variety of reasons. Some are trying out for school musicals, some front their own bands and want to expand their vocal range, and others just love to sing and want to learn proper technique. Whatever your motivations are you will work with trained professionals who will help you develop critical techniques and beyond. A sample of what a voice student will work on includes proper breathing, support, pitch, and range. More advanced training will cover dynamics, further developing chest and head voices, pronunciation, and more. You will also be able to work on performance techniques as many of our teachers have extensive performance experience. Vocal coaching starts at around age 10 with serious work starting post-puberty. Most lessons are half-hour, though some students find the benefit of taking a longer lesson, either 45 minutes or an hour.